Temple could see that the Church of England was losing influence in popular life, concerned as it was with supporting Empire and offering a broad, public morality confined to such issues as gambling, drink, and sexual behavior. By contrast, Temple was humble and accessible. Young people flocked to him: in a series of lectures at Oxford in 1931, he challenged students to follow Christ in the world, and find their purpose in lifting up those who suffered. He later articulated seven principles consistent with Christian social action, including affordable housing, education for all children, a secure, sustainable income for all citizens, and a voice for every worker in the conduct of their workplace. He made great strides in ecumenical relations in England and reformed Church of England schools. He urged the British government to accept Jewish refugees, and spoke out against anti-Semitism. Together with a leading rabbi, he established the British Council of Christians and Jews. 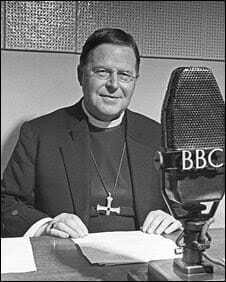 He embraced public outreach: in one of his frequent BBC radio addresses, he spoke so persuasively about the moral imperative of the war against Hitler (the Church’s official position had been pacifism), it was said that he changed the minds of the British virtually overnight. Later Churchill, who needed to sustain public morale during the war effort (but didn’t support Temple’s social program) asked that he be made Archbishop of Canterbury. When he died suddenly in 1944, all of Britain mourned “the people’s Archbishop.” He is commemorated by the Episcopal Church on November 6. The feast of William Temple will be celebrated on Sunday, November 18, at 5 p.m. with a special choral evensong at Trinity Episcopal Cathedral (147 NW 19th Ave, Portland). The event will bring together the choirs of Trinity Cathedral, St. Michael & All Angels, and St. Paul’s, Salem. A reception will follow. All donations will benefit William Temple House programs. Founded in 1965 by lay members of the Episcopal Diocese of Oregon and the Rev. Canon C.T. Abbott, William Temple House is a nonprofit agency supporting the mental, physical, and spiritual needs of individuals and families in the Portland metropolitan area. Last year, William Temple House received more than 11,000 client visits for services, including low- and no-cost mental health counseling sessions; emergency social services, including healthy food, hygiene items, new clothing for children, dental and vision care, and prescription assistance; and spiritual care. In addition to support from individuals, foundations, and partner organizations, the William Temple House Thrift Store on NW Glisan Street helps sustain its mission to restore hope and renew strength in individuals and families in a welcoming and respectful atmosphere.